AW-Lake Company customized a flow management and reporting solution that automated EPA compliance of VOC emissions for an OEM manufacturer’s paint operations at three regional plants in Ohio. To more accurately report VOC emissions as required by the state, the OEM manufacturer wanted to replace manual methods of gathering and recording data that often resulted in inaccurate overages with an automated process that tracked paint usage and calculated VOC emissions while populating EPA reports for electronic submission. The company also wanted visibility into daily operations as it never knew which plants performed within VOC emission limits on any given day. 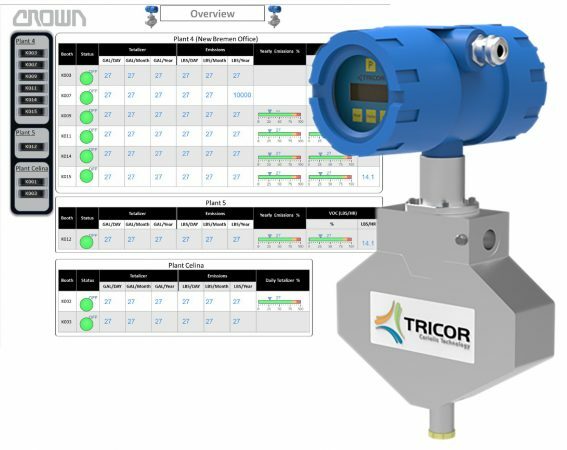 Installed outside of paint booths, the TRICOR Coriolis mass flow meters accurately convert paint mass flow into volumetric flow at a rate of 100-500 cubic centimetres per minute as paint flows from drums through pipelines and eventually to spray guns that dispense the paint. The TCM 0650 mass flow meters are daisy chained by EtherNet cables to a factory Intranet where third-party software uses EPA formulas to calculate daily VOC totals by location and populates EPA forms for electronic submission. The flow management system also provides visibility into operations on dashboards, with bar graphs indicating current levels of VOC emissions by plant. In addition, the software maintains totals of EPA-defined limits by day, month and year for historical analysis. Since implementing the AW-Lake flow management and reporting system, the OEM maintains accurate VOC emission levels while gaining a complete view of total operations in one control system. With access to historical data, the company can plan future activities to avoid exceeding EPA limits while operating more efficiently.